Some Perspective On Separation: When faced with the task of recording a band in one room, many small-studio recordists instinctively try to move the instruments as far as possible from each other and booth everyone off behind acoustic barriers. This is often quite unnecessary, as the following session demonstrates: a live full-band recording where the electric guitars were two feet either side of the drummer's kick drum, and the bass was only six feet in front of the kit. Here are the overhead microphones, for instance (Ex10.01:WAV/MP3 ), which usually pick up the most spill, but they actually pick up remarkably little because the guitar amps are firing away from them towards absorptive surfaces beside and behind the guitarists. The full 12-mic drums submix fares little worse (Ex10.02:WAV/MP3 ). Similarly, the bass amp's mic doesn't pick up much spill at all on account of its close placement and the use of a supplementary DI feed (Ex10.03:WAV/MP3 ), and it was the same story with the guitars even though those didn't use DIs -- remember that close-mic placements are typically tolerated much more readily by electric instruments, especially (as in this case) if you multimic them to capture a more balanced picture of their frequency dispersion. Furthermore, because what spill remained followed extremely quickly behind the direct sound of each instrument, none of the instruments washed out once a complete rough mix of the whole peer-array had been put together (Ex10.04:WAV/MP3 ), despite minimal mix processing. 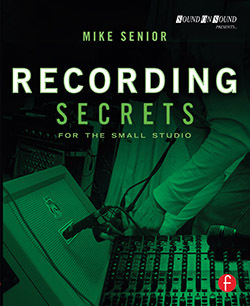 Clarifying The Terms 'Focus', 'Backdrop', 'Meld', and 'Ghost': In Chapter 10, the terms Focus, Backdrop, Meld, and Ghost are frequently used to explain the somewhat complicated mechanics of ensemble-recording mic technique. To help clarify what they mean, consider the following examples taken from this live 'band in a room' tracking session (Ex10.05:WAV/MP3 ). To take a simple example first, here's the vocal peer array (Ex10.07:WAV/MP3 ), comprising just a single mic. The Focus of this peer array is the singer, whereas its Backdrop comprises strong spill from the drums and slightly less from the two electric guitars. (The bass player was playing through a DI and monitoring in the control room, which is why he's completely absent from the live-room sound.) Now here's a submix of the drums (Ex10.06:WAV/MP3 ), recorded using a 'dominant array plus spots' technique, within which each of the spot mics has its own Focus and Backdrop: in the case of the snare close-mic, for instance, its Focus would be the snare drum, while its Backdrop would be the spill from all the other drums and cymbals in the kit. However, within the contest of the full-band peer-array setup, the Focus of the drumkit peer array is the whole drumkit, while the Backdrop of that peer array comprises the spill from the electric guitars and, to a much lesser extent, the singer. Melding the vocal microphone with the drums typically involves much more than just mixing them together, because many live-room tweaks may also be required to get an acceptable combined Focus (drums and vocals) and Backdrop (guitars) sound. Now let's say that the vocal-plus-drums Meld sounded like this (Ex10.08:WAV/MP3 ), and that I next wanted to mix in the low, chugging, rhythm guitar. Before even unmuting that guitar's own peer array, I'd first listen carefully to what it sounded like in the Meld's combined Backdrop -- in other words, what I call the guitar's Ghost -- allowing me to design the sound of the guitar peer array itself to complement that. So, for instance, the rather boomy sound of the guitar's Ghost might encourage me to choose a thinner-sounding microphone or mic position for its peer array. The Power Of Duvets & Quilts: In the book, I often recommend using duvets and thick quilts as impromptu absorbers, based on my own real-world session experience. However, this recent article includes acoustic measurement data which corroborates how well they perform, even in side-by-side tests with pricier purpose-designed foam and mineral-wool absorbers. To demonstrate the effects of using duvets as absorbers, here are some audio examples I've done on my own sessions. The guitar spill on this overheads recording (Ex10.10:WAV/MP3 ), for instance, is considerably reduced by putting a thick duvet up behind/beside each guitarist to reduce the amount of guitar-amp sound bouncing towards the drum setup from nearby walls (Ex10.11:WAV/MP3 ). By the same token, some cymbal-spill harshness on one of the guitar peer arrays (Ex10.12:WAV/MP3 ) is mitigated by using a duvet to shield one of its two close mics from ceiling reflections (Ex10.13:WAV/MP3 ). Correction: In Figure 10.9 on page 308, the arrows labelling the SE Electronics SE1A microphones are a little awry -- they should be pointing directly at the piano mics. Some Examples Of Real-world Peer-array Sessions: Quite a few of the projects listed in my 'Mixing Secrets' Free Multitrack Download Library are based around peer-array ensemble recordings, and some of these provide further information about the recording process and the mixability of the results. For example, I wrote about the Dunning Kruger EP peer-array recordings for Sound On Sound magazine's inaugural October 2012 Session Notes feature, and elaborated on the mixability of those three multitracks in these related Discussion Zone 'More Info...' posts (1, 2, 3). More recently, the June 2015 Session Notes column showcased another extensive small-studio peer-array session for the acoustic band Spektakulatius -- further detailed information about the setup can be found on this resources page and I further discussed the mixing of the project in this follow-up magazine article. The multitracks provided by mic-manufacturer Telefunken are also worth checking out, because they all have supporting documentation and session photos, and the following ones also include peer-array recordings: Abletones Big Band; Rounders; Java Jive Sessions. Mic-mounting Hardware Tips: Here are links to the product pages of a couple of little K&M mic-mounting widgets I mentioned in this Chapter: the 238 Microphone Holder, which can be used in conjunction with a cheap lighting stand to position multimic arrays several meters up in the air; and the 21431 Mini Boom Arm, which can be fitted to any other stand as a drop-arm. Alternatively, Superlux do a ridiculously affordable and rugged mic stand called the MS200, which has a vertical reach of more than 5m, although this only seems to be available in Europe. Phantom-powered Signal Generator: Superlux also do a great little gizmo for single-handed line-checking, rejoicing in the name The Pink Stick. (Titter Ye Not!) A couple of other great little line-checking gizmos are available from Axel Joost Elektronik: the XLR Generator and XLR Tester. Quilts & Duvets As Acoustic Absorbers: For some interesting technical data on how surprisingly effective quilts can be as acoustic absorbers, check out this Sound On Sound magazine article, where they pitted the humble duvet against a variety of off-the-shelf acoustic absorption panels: 'Choosing & Using Porous Absorbers'. The Dangers Of Sagging Phantom Power: If you'd like to know more about what you stand to lose if your phantom-power supply isn't up the job of powering all your mics, and indeed how to test for it, check out this article from Joerg Wuttke of Schoeps: 'The Feeble Phantom'. Uninterruptible Power Supplies For Small Studios: Here are a few resources on the subject you may find useful if you're planning to invest in a UPS for your recording work: 'Adding A UPS To Your Home Studio' is a friendly introduction, whereas there's a bit more nitty-gritty detail in this Recording magazine 'AC Power Handling' feature.